"Nuclear War" redirects here. For other uses, see Nuclear War (disambiguation). "Atomic war" redirects here. It is not to be confused with Atomic Wars. "Nuclear strike" redirects here. For other uses, see Nuclear strike (disambiguation). The Titan II Intercontinental ballistic missile (ICBM) carried a 9 Mt W53 warhead, one of the most powerful nuclear weapons fielded by the United States during the Cold War. Nuclear warfare (sometimes atomic warfare or thermonuclear warfare) is a military conflict or political strategy in which nuclear weaponry is used to inflict damage on the enemy. Nuclear weapons are weapons of mass destruction; in contrast to conventional warfare, nuclear warfare can produce destruction in a much shorter time and can have a long-lasting radiological warfare result. A major nuclear exchange would have long-term effects, primarily from the fallout released, and could also lead to a "nuclear winter" that could last for decades, centuries, or even millennia after the initial attack. Some analysts dismiss the nuclear winter hypothesis, and calculate that even with nuclear weapon stockpiles at Cold War highs, although there would be billions of casualties, billions more rural people would nevertheless survive. However, others have argued that secondary effects of a nuclear holocaust, such as nuclear famine and societal collapse, would cause almost every human on Earth to starve to death. So far, two nuclear weapons have been used in the course of warfare, both by the United States near the end of World War II. On August 6, 1945, a uranium gun-type device (code name "Little Boy") was detonated over the Japanese city of Hiroshima. Three days later, on August 9, a plutonium implosion-type device (code name "Fat Man") was detonated over the Japanese city of Nagasaki. These two bombings resulted in the deaths of approximately 120,000 people. After World War II, nuclear weapons were also developed by the Soviet Union (1949), the United Kingdom (1952), France (1960), and the People's Republic of China (1964), which contributed to the state of conflict and extreme tension that became known as the Cold War. In 1974, India, and in 1998, Pakistan, two countries that were openly hostile toward each other, developed nuclear weapons. Israel (1960s) and North Korea (2006) are also thought to have developed stocks of nuclear weapons, though it is not known how many. The Israeli government has never admitted or denied to having nuclear weapons, although it is known to have constructed the reactor and reprocessing plant necessary for building nuclear weapons. South Africa also manufactured several complete nuclear weapons in the 1980s, but subsequently became the first country to voluntarily destroy their domestically made weapons stocks and abandon further production (1990s). Nuclear weapons have been detonated on over 2,000 occasions for testing purposes and demonstrations. 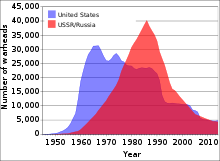 After the collapse of the Soviet Union in 1991 and the resultant end of the Cold War, the threat of a major nuclear war between the two nuclear superpowers was generally thought to have declined. Since then, concern over nuclear weapons has shifted to the prevention of localized nuclear conflicts resulting from nuclear proliferation, and the threat of nuclear terrorism. The possibility of using nuclear weapons in war is usually divided into two subgroups, each with different effects and potentially fought with different types of nuclear armaments. The second, a full-scale nuclear war, could consist of large numbers of nuclear weapons used in an attack aimed at an entire country, including military, economic, and civilian targets. Such an attack would almost certainly destroy the entire economic, social, and military infrastructure of the target nation, and would probably have a devastating effect on Earth's biosphere. Some Cold War strategists such as Henry Kissinger argued that a limited nuclear war could be possible between two heavily armed superpowers (such as the United States and the Soviet Union). Some predict, however, that a limited war could potentially "escalate" into a full-scale nuclear war. Others[who?] have called limited nuclear war "global nuclear holocaust in slow motion", arguing that—once such a war took place—others would be sure to follow over a period of decades, effectively rendering the planet uninhabitable in the same way that a "full-scale nuclear war" between superpowers would, only taking a much longer (and arguably more agonizing) path to the same result. Even the most optimistic predictions[by whom?] of the effects of a major nuclear exchange foresee the death of many millions of victims within a very short period of time. More pessimistic predictions argue that a full-scale nuclear war could potentially bring about the extinction of the human race, or at least its near extinction, with only a relatively small number of survivors (mainly in remote areas) and a reduced quality of life and life expectancy for centuries afterward. However, such predictions, assuming total war with nuclear arsenals at Cold War highs, have not been without criticism. Such a horrific catastrophe as global nuclear warfare would almost certainly cause permanent damage to most complex life on the planet, its ecosystems, and the global climate. If predictions about the production of a nuclear winter are accurate, it would also change the balance of global power, with countries such as Australia, New Zealand, India, China, Argentina and Brazil predicted to become world superpowers if the Cold War ever led to a large-scale nuclear attack. A study presented at the annual meeting of the American Geophysical Union in December 2006 asserted that even a small-scale regional nuclear war could produce as many direct fatalities as all of World War II and disrupt the global climate for a decade or more. In a regional nuclear conflict scenario in which two opposing nations in the subtropics each used 50 Hiroshima-sized nuclear weapons (c. 15 kiloton each) on major population centers, the researchers predicted fatalities ranging from 2.6 million to 16.7 million per country. The authors of the study estimated that as much as five million tons of soot could be released, producing a cooling of several degrees over large areas of North America and Eurasia (including most of the grain-growing regions). The cooling would last for years and could be "catastrophic", according to the researchers. Either a limited or full-scale nuclear exchange could occur during an accidental nuclear war, in which the use of nuclear weapons is triggered unintentionally. Postulated triggers for this scenario have included malfunctioning early warning devices and/or targeting computers, deliberate malfeasance by rogue military commanders, consequences of an accidental straying of warplanes into enemy airspace, reactions to unannounced missile tests during tense diplomatic periods, reactions to military exercises, mistranslated or miscommunicated messages, and others. A number of these scenarios actually occurred during the Cold War, though none resulted in the use of nuclear weapons. Many such scenarios have been depicted in popular culture, such as in the 1959 film On the Beach, the 1962 novel Fail-Safe (released as a film in 1964); the film Dr. Strangelove or: How I Learned to Stop Worrying and Love the Bomb, also released in 1964; the film WarGames, released in 1983. Mushroom cloud from the atomic explosion over Nagasaki rising 18,000 m (59,000 ft) into the air on the morning of August 9, 1945. During the final stages of World War II in 1945, the United States conducted atomic raids on the Japanese cities of Hiroshima and Nagasaki, the first on August 6, 1945, and the second on August 9, 1945. These two events were the only times nuclear weapons have been used in combat. For six months before the atomic bombings, the U.S. 20th Air Force under General Curtis LeMay executed low-level incendiary raids against Japanese cities. The worst air raid to occur during the process was not the nuclear attacks, but the Operation Meetinghouse raid on Tokyo. On the night of March 9–10, 1945, Operation Meetinghouse commenced and 334 Boeing B-29 Superfortress bombers took off to raid, with 279 of them dropping 1,665 tons of incendiaries and explosives on Tokyo. The bombing was meant to burn wooden buildings and indeed the bombing caused fire that created a 50 m/s wind, which is comparable to tornadoes. Each bomber carried 6 tons of bombs. A total of 381,300 bombs, which amount to 1,783 tons of bombs, were used in the bombing. Within a few hours of the raid, it had killed an estimated 100,000 people and destroyed 41 km2 (16 sq mi) of the city and 267,000 buildings in a single night — the deadliest bombing raid in military aviation history other than the atomic raids on Hiroshima and Nagasaki. By early August 1945, an estimated 450,000 people had died as the U.S. had intensely firebombed a total of 67 Japanese cities. In late June 1945, as the U.S. wrapped up the two-and-a-half-month Battle of Okinawa (which cost the lives of 260,000 people, including 150,000 civilians), it was faced with the prospect of invading the Japanese home islands in an operation codenamed Operation Downfall. Based on the U.S. casualties from the preceding island-hopping campaigns, American commanders estimated that between 50,000 and 500,000 U.S. troops would die and at least 600,000–1,000,000 others would be injured while invading the Japanese home islands. The U.S. manufacture of 500,000 Purple Hearts from the anticipated high level of casualties during the U.S. invasion of Japan gave a demonstration of how deadly and costly it would be. President Harry S. Truman realized he could not afford such a horrendous casualty rate, especially since over 400,000 American combatants had already died fighting in both the European and the Pacific theaters of the war. On July 26, 1945, the United States, the United Kingdom, and the Republic of China issued a Potsdam Declaration that called for the unconditional surrender of Japan. It stated that if Japan did not surrender, it would face "prompt and utter destruction". The Japanese government ignored this ultimatum, sending a message that they were not going to surrender. In response to the rejection, President Truman authorized the dropping of the atomic bombs. At the time of its use, there were only two atomic bombs available, and despite the fact that more were in production back in mainland U.S., the third bomb wouldn't be available for combat until September. 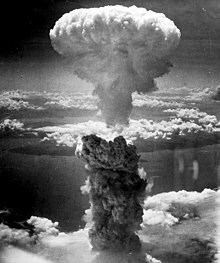 On August 6, 1945, the uranium-type nuclear weapon codenamed "Little Boy" was detonated over the Japanese city of Hiroshima with an energy of about 15 kilotons of TNT (63,000 gigajoules), destroying nearly 50,000 buildings (including the headquarters of the 2nd General Army and Fifth Division) and killing approximately 70,000 people, including 20,000 Japanese combatants and 20,000 Korean slave laborers. Three days later, on August 9, a plutonium-type nuclear weapon codenamed "Fat Man" was used against the Japanese city of Nagasaki, with the explosion equivalent to about 20 kilotons of TNT (84,000 gigajoules), destroying 60% of the city and killing approximately 35,000 people, including 23,200–28,200 Japanese munitions workers, 2,000 Korean slave laborers, and 150 Japanese combatants. The industrial damage in Nagasaki was high, partly owing to the inadvertent targeting of the industrial zone, leaving 68–80 percent of the non-dock industrial production destroyed. Six days after the detonation over Nagasaki, Japan announced its surrender to the Allied Powers on August 15, 1945, signing the Instrument of Surrender on September 2, 1945, officially ending the Pacific War and, therefore, World War II, as Germany had already signed its Instrument of Surrender on May 8, 1945, ending the war in Europe. The two atomic bombings led, in part, to post-war Japan's adopting of the Three Non-Nuclear Principles, which forbade the nation from developing nuclear armaments. We knew the world would not be the same. A few people laughed, a few people cried, most people were silent. I remembered the line from the Hindu scripture the Bhagavad Gita. Vishnu is trying to persuade the prince that he should do his duty and to impress him takes on his multiarmed form and says, "Now, I am become Death, the destroyer of worlds." I suppose we all thought that one way or another. Immediately after the atomic bombings of Japan, the status of atomic weapons in international and military relations was unclear. Presumably, the United States hoped atomic weapons could offset the Soviet Union's larger conventional ground forces in Eastern Europe, and possibly be used to pressure Soviet leader Joseph Stalin into making concessions. Under Stalin, the Soviet Union pursued its own atomic capabilities through a combination of scientific research and espionage directed against the American program. The Soviets believed that the Americans, with their limited nuclear arsenal, were unlikely to engage in any new world wars, while the Americans were not confident they could prevent a Soviet takeover of Europe, despite their atomic advantage. Within the United States the authority to produce and develop nuclear weapons was removed from military control and put instead under the civilian control of the United States Atomic Energy Commission. 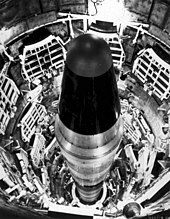 This decision reflected an understanding that nuclear weapons had unique risks and benefits that were separate from other military technology known at the time. For several years after World War II, the United States developed and maintained a strategic force based on the Convair B-36 bomber that would be able to attack any potential enemy from bomber bases in the United States. It deployed atomic bombs around the world for potential use in conflicts. Over a period of a few years, many in the American defense community became increasingly convinced of the invincibility of the United States to a nuclear attack. Indeed, it became generally believed that the threat of nuclear war would deter any strike against the United States. American and Soviet nuclear stockpiles. On August 29, 1949, the Soviet Union tested its first nuclear weapon at Semipalatinsk in Kazakhstan (see also Soviet atomic bomb project). Scientists in the United States from the Manhattan Project had warned that, in time, the Soviet Union would certainly develop nuclear capabilities of its own. Nevertheless, the effect upon military thinking and planning in the United States was dramatic, primarily because American military strategists had not anticipated the Soviets would "catch up" so soon. However, at this time, they had not discovered that the Soviets had conducted significant nuclear espionage of the project from spies at Los Alamos, the most significant of which was done by the theoretical physicist Klaus Fuchs. The first Soviet bomb was more or less a deliberate copy of the Fat Man plutonium device. In the same year the first US-Soviet nuclear war plan was penned in the US with Operation Dropshot. With the monopoly over nuclear technology broken, worldwide nuclear proliferation accelerated. The United Kingdom tested its first independent atomic bomb in 1952, followed by France in 1960 and then China in 1964. While much smaller than the arsenals of the United States and the Soviet Union, Western Europe's nuclear reserves were nevertheless a significant factor in strategic planning during the Cold War. A top-secret White Paper, compiled by the Royal Air Force and produced for the British Government in 1959, estimated that British bombers carrying nuclear weapons were capable of destroying key cities and military targets in the Soviet Union, with an estimated 16 million deaths in the Soviet Union (half of whom were estimated to be killed on impact and the rest fatally injured) before bomber aircraft from the U.S. Strategic Air Command reached their targets. Although the Soviet Union had nuclear weapon capabilities in the beginning of the Cold War, the United States still had an advantage in terms of bombers and weapons. In any exchange of hostilities, the United States would have been capable of bombing the Soviet Union, whereas the Soviet Union would have more difficulty carrying out the reverse mission. The widespread introduction of jet-powered interceptor aircraft upset this imbalance somewhat by reducing the effectiveness of the American bomber fleet. In 1949 Curtis LeMay was placed in command of the Strategic Air Command and instituted a program to update the bomber fleet to one that was all-jet. During the early 1950s the B-47 and B-52 were introduced, providing the ability to bomb the Soviet Union more easily. Before the development of a capable strategic missile force in the Soviet Union, much of the war-fighting doctrine held by western nations revolved around using a large number of smaller nuclear weapons in a tactical role. It is debatable whether such use could be considered "limited" however, because it was believed that the United States would use its own strategic weapons (mainly bombers at the time) should the Soviet Union deploy any kind of nuclear weapon against civilian targets. Douglas MacArthur, an American general, was fired by President Harry Truman, partially because he persistently requested permission to use his own discretion in deciding whether to utilize atomic weapons on the People's Republic of China in 1951 during the Korean War. Mao Zedong, China's communist leader, gave the impression that he would welcome a nuclear war with the capitalists because it would annihilate what he viewed as their "imperialist" system. Let us imagine how many people would die if war breaks out. There are 2.7 billion people in the world, and a third could be lost. If it is a little higher it could be half ... I say that if the worst came to the worst and one-half dies, there will still be one-half left, but imperialism would be razed to the ground and the whole world would become socialist. After a few years there would be 2.7 billion people again. The U.S. and USSR conducted hundreds of nuclear tests, including the Desert Rock exercises at the Nevada Test Site, USA, pictured above during the Korean War to familiarize their soldiers with conducting operations and counter-measures around nuclear detonations, as the Korean War threatened to expand. The concept of a "Fortress North America" emerged during the Second World War and persisted into the Cold War to refer to the option of defending Canada and the United States against their enemies if the rest of the world were lost to them. This option was rejected with the formation of NATO and the decision to permanently station troops in Europe. In the summer of 1951 Project Vista started, in which project analysts such as Robert F. Christy looked at how to defend Western Europe from a Soviet invasion. The emerging development of tactical nuclear weapons were looked upon as a means to give Western forces a qualitative advantage over the Soviet numerical supremacy in conventional weapons. Several scares about the increasing ability of the Soviet Union's strategic bomber forces surfaced during the 1950s. The defensive response by the United States was to deploy a fairly strong "layered defense" consisting of interceptor aircraft and anti-aircraft missiles, like the Nike, and guns, like the Skysweeper, near larger cities. However, this was a small response compared to the construction of a huge fleet of nuclear bombers. The principal nuclear strategy was to massively penetrate the Soviet Union. Because such a large area could not be defended against this overwhelming attack in any credible way, the Soviet Union would lose any exchange. This logic became ingrained in American nuclear doctrine and persisted for much of the duration of the Cold War. As long as the strategic American nuclear forces could overwhelm their Soviet counterparts, a Soviet pre-emptive strike could be averted. Moreover, the Soviet Union could not afford to build any reasonable counterforce, as the economic output of the United States was far larger than that of the Soviets, and they would be unable to achieve "nuclear parity". Soviet nuclear doctrine, however, did not match American nuclear doctrine. Soviet military planners assumed they could win a nuclear war. Therefore, they expected a large-scale nuclear exchange, followed by a "conventional war" which itself would involve heavy use of tactical nuclear weapons. American doctrine rather assumed that Soviet doctrine was similar, with the mutual in Mutually Assured Destruction necessarily requiring that the other side see things in much the same way, rather than believing—as the Soviets did—that they could fight a large-scale, "combined nuclear and conventional" war. In accordance with their doctrine, the Soviet Union conducted large-scale military exercises to explore the possibility of defensive and offensive warfare during a nuclear war. The exercise, under the code name of "Snowball", involved the detonation of a nuclear bomb about twice as powerful as that which fell on Nagasaki and an army of approximately 45,000 soldiers on maneuvers through the hypocenter immediately after the blast. The exercise was conducted on September 14, 1954, under command of Marshal Georgy Zhukov to the north of Totskoye village in Orenburg Oblast, Russia. A revolution in nuclear strategic thought occurred with the introduction of the intercontinental ballistic missile (ICBM), which the Soviet Union first successfully tested in August 1957. In order to deliver a warhead to a target, a missile was much faster and more cost-effective than a bomber, and enjoyed a higher survivability due to the enormous difficulty of interception of the ICBMs (due to their high altitude and extreme speed). The Soviet Union could now afford to achieve nuclear parity with the United States in raw numbers, although for a time, they appeared to have chosen not to. Photos of Soviet missile sites set off a wave of panic in the U.S. military, something the launch of Sputnik would do for the American public a few months later. Politicians, notably then-U.S. Senator John F. Kennedy suggested that a "missile gap" existed between the Soviet Union and the United States. The US military gave missile development programs the highest national priority, and several spy aircraft and reconnaissance satellites were designed and deployed to observe Soviet progress. Early ICBMs and bombers were relatively inaccurate, which led to the concept of countervalue strikes — attacks directly on the enemy population, which would theoretically lead to a collapse of the enemy's will to fight. During the Cold War, the Soviet Union invested in extensive protected civilian infrastructure, such as large "nuclear-proof" bunkers and non-perishable food stores. By comparison, smaller scale civil defense programs were instituted in the United States starting in the 1950s, where schools and other public buildings had basements stocked with non-perishable food supplies, canned water, first aid, and dosimeter and Geiger counter radiation-measuring devices. Many of the locations were given "Fallout shelter" designation signs. CONELRAD radio information systems were adopted, whereby the commercial radio sector (later supplemented by the National Emergency Alarm Repeaters) would broadcast on two AM frequencies in the event of a Civil Defense (CD) emergency. These two frequencies, 640 and 1240 kHz, were marked with small CD triangles on the tuning dial of radios of the period, as can still be seen on 1950s-vintage radios on online auction sites and museums. A few backyard fallout shelters were built by private individuals. Henry Kissinger's view on tactical nuclear war in his controversial 1957 book Nuclear Weapons and Foreign Policy was that any nuclear weapon exploded in air burst mode that was below 500 kiloton in yield and thus averting serious fallout, may be more decisive and less costly in human lives than a protracted conventional war. A list of targets made by the U.S.A. was released sometime during December 2015 by the U.S. National Archives and Records Administration. The language used to describe targets is "designated ground zeros". The list was released after a request was made during 2006 by William Burr who belongs to a research group at George Washington University, and belongs to a previously top-secret 800-page document. The list is entitled "Atomic Weapons Requirements Study for 1959" and was produced by U.S. Strategic Air Command during the year 1956. In 1960, the United States developed its first Single Integrated Operational Plan, a range of targeting options, and described launch procedures and target sets against which nuclear weapons would be launched, variants of which were in use from 1961 to 2003. That year also saw the start of the Missile Defense Alarm System, an American system of 12 early-warning satellites that provided limited notice of Soviet intercontinental ballistic missile launches between 1960 and 1966. The Ballistic Missile Early Warning System was completed in 1964. 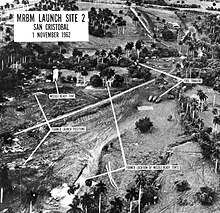 A complex and worrisome situation developed in 1962, in what is called the Cuban Missile Crisis. The Soviet Union placed medium-range ballistic missiles 90 miles (140 km) from the United States, possibly as a direct response to American Jupiter missiles placed in Turkey. After intense negotiations, the Soviets ended up removing the missiles from Cuba and decided to institute a massive weapons-building program of their own. In exchange, the United States dismantled its launch sites in Turkey, although this was done secretly and not publicly revealed for over two decades. Khrushchev did not even reveal this part of the agreement when he came under fire by political opponents for mishandling the crisis. Communication delays during the crisis led to the establishment of the Moscow–Washington hotline to allow reliable, direct communications between the two nuclear powers. By the late 1960s, the number of ICBMs and warheads was so high on both sides that it was believed that both the United States and the Soviet Union were capable of completely destroying the infrastructure and a large proportion of the population of the other country. Thus, by some western game theorists, a balance of power system known as mutually assured destruction (or MAD) came into being. It was thought that no full-scale exchange between the powers would result in an outright winner, with at best one side emerging the pyrrhic victor. Thus both sides were deterred from risking the initiation of a direct confrontation, instead being forced to engage in lower intensity proxy wars. During this decade the People's Republic of China began to build subterranean infrastructure such as the Underground Project 131 following the Sino-Soviet split. One drawback of the MAD doctrine was the possibility of a nuclear war occurring without either side intentionally striking first. Early Warning Systems (EWS) were notoriously error-prone. For example, on 78 occasions in 1979 alone, a "missile display conference" was called to evaluate detections that were "potentially threatening to the North American continent". Some of these were trivial errors and were spotted quickly, but several went to more serious levels. On September 26, 1983, Stanislav Petrov received convincing indications of an American first strike launch against the Soviet Union, but positively identified the warning as a false alarm. Though it is unclear what role Petrov's actions played in preventing a nuclear war during this incident, he has been honored by the United Nations for his actions. Similar incidents happened many times in the United States, due to failed computer chips, misidentifications of large flights of geese, test programs, and bureaucratic failures to notify early warning military personnel of legitimate launches of test or weather missiles. For many years, the U.S. Air Force's strategic bombers were kept airborne on a daily rotating basis "around the clock" (see Operation Chrome Dome), until the number and severity of accidents, the 1968 Thule Air Base B-52 crash in particular, persuaded policymakers it was not worthwhile. Israel responded to the Arab Yom Kippur War attack on 6 October 1973 by assembling 13 nuclear weapons in a tunnel under the Negev desert when Syrian tanks were sweeping in across the Golan Heights. On 8 October 1973, Israeli Prime Minister Mrs Golda Meir authorized Defense Minister Moshe Dayan to activate the 13 Israeli nuclear warheads and distribute them to Israeli air force units, with the intent that they be used if Israel began to be overrun. On 24 October 1973, as US President Richard Nixon was preoccupied with the Watergate scandal, Henry Kissinger ordered a DEFCON-3 alert preparing American B-52 nuclear bombers for war. Intelligence reports indicated that the USSR was preparing to defend Egypt in its Yom Kippur War with Israel. It had become apparent that if Israel had dropped nuclear weapons on Egypt or Syria, as it prepared to do, then the USSR would have retaliated against Israel, with the US then committed to providing Israeli assistance, possibly escalating to a general nuclear war. By the late 1970s, people in both the United States and the Soviet Union, along with the rest of the world, had been living with the concept of mutual assured destruction (MAD) for about a decade, and it became deeply ingrained into the psyche and popular culture of those countries. On May 18, 1974, India conducted its first nuclear test in the Pokhran test range. The name of the operation was Smiling Buddha, and India termed the test as a "peaceful nuclear explosion". The Soviet Duga early warning over-the-horizon radar system was made operational in 1976. The extremely powerful radio transmissions needed for such a system led to much disruption of civilian shortwave broadcasts, earning it the nickname "Russian Woodpecker". The idea that any nuclear conflict would eventually escalate was a challenge for military strategists. This challenge was particularly severe for the United States and its NATO allies. It was believed (until the 1970s) that a Soviet tank invasion of Western Europe would quickly overwhelm NATO conventional forces, leading to the necessity of the West escalating to the use of tactical nuclear weapons, one of which was the W-70. This strategy had one major (and possibly critical) flaw, which was soon realized by military analysts but highly underplayed by the U.S. military: conventional NATO forces in the European theatre of war were far outnumbered by similar Soviet and Warsaw Pact forces, and it was assumed that in case of a major Soviet attack (commonly envisioned as the "Red tanks rolling towards the North Sea" scenario) that NATO—in the face of quick conventional defeat—would soon have no other choice but to resort to tactical nuclear strikes against these forces. Most analysts agreed that once the first nuclear exchange had occurred, escalation to global nuclear war would likely become inevitable. The Soviet bloc's vision of an atomic war between NATO and Warsaw Pact forces was simulated in the top secret exercise Seven Days to the River Rhine in 1979. The British government exercised their vision of Soviet nuclear attack with Square Leg in early 1980. Large hardened nuclear weapon storage areas were built across European countries in anticipation of local US and European forces falling back as the conventional NATO defense from the Soviet Union, named REFORGER, was believed to only be capable of stalling the Soviets for a short time. 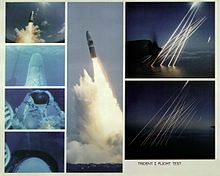 Montage of the launch of a Trident C4 SLBM and the paths of its reentry vehicles. In the late 1970s and, particularly, during the early 1980s under U.S. President Ronald Reagan, the United States renewed its commitment to a more powerful military, which required a large increase in spending on U.S. military programs. These programs, which were originally part of the defense budget of U.S. President Jimmy Carter, included spending on conventional and nuclear weapons systems. Under Reagan, defensive systems like the Strategic Defense Initiative were emphasized as well. Another major shift in nuclear doctrine was the development and the improvement of the submarine-launched, nuclear-armed, ballistic missile, or SLBM. It was hailed by many military theorists as a weapon that would make nuclear war less likely. SLBMs—which can move with "stealth" (greatly lessened detectability) virtually anywhere in the world—give a nation a "second strike" capability (i.e., after absorbing a "first strike"). Before the advent of the SLBM, thinkers feared that a nation might be tempted to initiate a first strike if it felt confident that such a strike would incapacitate the nuclear arsenal of its enemy, making retaliation impossible. With the advent of SLBMs, no nation could be certain that a first strike would incapacitate its enemy's entire nuclear arsenal. To the contrary, it would have to fear a near certain retaliatory second strike from SLBMs. Thus, a first strike was a much less feasible (or desirable) option, and a deliberately initiated nuclear war was thought to be less likely to start. However, it was soon realized that submarines could approach enemy coastlines undetected and decrease the warning time (the time between detection of the missile launch and the impact of the missile) from as much as half an hour to possibly under three minutes. This effect was especially significant to the United States, Britain and China, whose capitals all lay within 100 miles (160 km) of their coasts. Moscow was much more secure from this type of threat, due to its considerable distance from the sea. This greatly increased the credibility of a "surprise first strike" by one faction and (theoretically) made it possible to knock out or disrupt the chain of command of a target nation before any counterstrike could be ordered (known as a "decapitation strike"). It strengthened the notion that a nuclear war could possibly be "won", resulting not only in greatly increased tensions and increasing calls for fail-deadly control systems, but also in a dramatic increase in military spending. The submarines and their missile systems were very expensive, and one fully equipped nuclear-powered and nuclear-armed missile submarine could cost more than the entire GNP of a developing country. It was also calculated, however, that the greatest cost came in the development of both sea- and land-based anti-submarine defenses and in improving and strengthening the "chain of command", and as a result, military spending skyrocketed. South Africa developed a nuclear weapon capability during the 1970s and early 1980s. It was operational for a brief period before being dismantled in the early 1990s. According to the 1980 United Nations report General and Complete Disarmament: Comprehensive Study on Nuclear Weapons: Report of the Secretary-General, it was estimated that there were a total of about 40,000 nuclear warheads in existence at that time, with a potential combined explosive yield of approximately 13,000 megatons. By comparison, when the volcano Mount Tambora erupted in 1815—turning 1816 into the Year Without A Summer due to the levels of global dimming sulfate aerosols and ash expelled—it exploded with a force of roughly 800 to 1,000 megatons, and ejected 160 km3 (38 cu mi) of mostly rock/tephra, that included 120 million tonnes of sulfur dioxide as an upper estimate. A larger eruption, approximately 74,000 years ago, in Mount Toba produced 2,800 km3 (670 cu mi) of tephra, forming lake Toba, and produced an estimated 6,000 million tonnes (6.6×109 short tons) of sulfur dioxide. The explosive energy of the eruption may have been as high as equivalent to 20,000,000 megatons (Mt) of TNT, while the asteroid created Chicxulub impact, that is connected with the extinction of the dinosaurs corresponds to at least 70,000,000 Mt of energy, which is roughly 7000 times the maximum arsenal of the US and Soviet Union. However, comparisons with supervolcanoes are more misleading than helpful due to the different aerosols released, the likely air burst fuzing height of nuclear weapons and the globally scattered location of these potential nuclear detonations all being in contrast to the singular and subterranean nature of a supervolcanic eruption. Moreover, assuming the entire world stockpile of weapons were grouped together, it would be difficult, due to the nuclear fratricide effect, to ensure the individual weapons would go off all at once. Nonetheless, many people believe that a full-scale nuclear war would result, through the nuclear winter effect, in the extinction of the human species, though not all analysts agree on the assumptions that underpin these nuclear winter models. On Sept. 1, 1983, Korean Air Lines Flight 007 was shot down by Soviet jet fighters. On the 26th, a Soviet early warning station under the command of Stanislav Petrov falsely detected 5 inbound intercontinental ballistic missiles from the US. Petrov correctly assessed the situation as a false alarm, and hence did not report his finding to his superiors. It is quite possible that his actions prevented "World War III", as the Soviet policy at that time was immediate nuclear response upon discovering inbound ballistic missiles. The world came unusually close to nuclear war when the Soviet Union thought that the NATO military exercise Able Archer 83 was a ruse or "cover-up" to begin a nuclear first strike. The Soviets responded by raising readiness and preparing their nuclear arsenal for immediate use. Soviet fears of an attack ceased once the exercise concluded without incident. Although the dissolution of the Soviet Union ended the Cold War and greatly reduced tensions between the United States and the Russian Federation, the Soviet Union's formal successor state, both countries remained in a "nuclear stand-off" due to the continuing presence of a very large number of deliverable nuclear warheads on both sides. Additionally, the end of the Cold War led the United States to become increasingly concerned with the development of nuclear technology by other nations outside of the former Soviet Union. In 1995, a branch of the U.S. Strategic Command produced an outline of forward-thinking strategies in the document "Essentials of Post–Cold War Deterrence". In 1996, a Russian continuity of government facility, Kosvinsky Mountain, which is believed to be a counterpart to the US Cheyenne Mountain Complex, was completed. It was designed to resist US earth-penetrating nuclear warheads, and is believed to host the Russian Strategic Rocket Forces alternate command post, a post for the general staff built to compensate for the vulnerability of older Soviet era command posts in the Moscow region. In spite of this, the primary command posts for the Strategic Rocket Forces remains Kuntsevo in Moscow and the secondary is the Kosvinsky Mountain in the Urals. The timing of the Kosvinsky facilities completion date is regarded as one explanation for U.S. interest in a new nuclear "bunker buster" Earth-penetrating warhead and the declaration of the deployment of the B-61 mod 11 in 1997; Kosvinsky is protected by about 1000 feet of granite. As a consequence of the 9/11 attacks, American forces immediately increased their readiness to the highest level in 28 years, closing the blast doors of the NORAD's Cheyenne Mountain Operations Center for the first time due to a non-exercise event. But unlike similar increases during the Cold War, Russia immediately decided to stand down a large military exercise in the Arctic region, in order to minimize the risk of incidents, rather than following suit. The former chair of the United Nations disarmament committee stated that there are more than 16,000 strategic and tactical nuclear weapons ready for deployment and another 14,000 in storage, with the U.S. having nearly 7,000 ready for use and 3,000 in storage, and Russia having about 8,500 ready for use and 11,000 in storage. In addition, China is thought to possess about 400 nuclear weapons, Britain about 200, France about 350, India about 80–100, and Pakistan 100–110. North Korea is confirmed as having nuclear weapons, though it is not known how many, with most estimates between 1 and 10. Israel is also widely believed to possess usable nuclear weapons. NATO has stationed about 480 American nuclear weapons in Belgium, the Netherlands, Italy, Germany, and Turkey, and several other nations are thought to be in pursuit of an arsenal of their own. Pakistan's nuclear policy was significantly affected by the 1965 war with India. The 1971 war and India's nuclear program played a role in Pakistan's decision to go nuclear. India and Pakistan both decided not to participate in the NPT. Pakistan's nuclear policy became fixated on India because India refused to join the NPT and remain opened to nuclear weapons. Impetus by Indian actions spurred Pakistan's nuclear research. After nuclear weapons construction was started by Bhutto's command, the chair of Pakistan Atomic Energy Commission Usmani quit in objection. The 1999 war between Pakistan and India occurred after both acquired nuclear weapons. It is believed by some that nuclear weapons are the reason a big war has not broken out in the subcontinent. India and Pakistan still have a risk of nuclear conflict on the issue of war over Kashmir. Nuclear capability deliverable by sea were claimed by Pakistan in 2012. The aim was to achieve a "minimum credible deterrence". Pakistan's nuclear program culminated in the tests at Chagai. One of the aims of Pakistan's programs is fending off potential annexation and maintaining independence. A key development in nuclear warfare throughout the 2000s and early 2010s is the proliferation of nuclear weapons to the developing world, with India and Pakistan both publicly testing several nuclear devices, and North Korea conducting an underground nuclear test on October 9, 2006. The U.S. Geological Survey measured a 4.2 magnitude earthquake in the area where the North Korean test is said to have occurred. A further test was announced by the North Korean government on May 25, 2009. Iran, meanwhile, has embarked on a nuclear program which, while officially for civilian purposes, has come under close scrutiny by the United Nations and many individual states. Recent studies undertaken by the CIA cite the enduring India-Pakistan conflict as the one "flash point" most likely to escalate into a nuclear war. During the Kargil War in 1999, Pakistan came close to using its nuclear weapons in case the conventional military situation underwent further deterioration. Pakistan's foreign minister had even warned that it would "use any weapon in our arsenal", hinting at a nuclear strike against India. The statement was condemned by the international community, with Pakistan denying it later on. This conflict remains the only war (of any sort) between two declared nuclear powers. The 2001-2002 India-Pakistan standoff again stoked fears of nuclear war between the two countries. Despite these very serious and relatively recent threats, relations between India and Pakistan have been improving somewhat over the last few years. However, with the November 26, 2008 Mumbai terror attacks, tensions again worsened. Another potential geopolitical issue which is considered particularly worrisome by military analysts is a possible conflict between the United States and the People's Republic of China over Taiwan. Although economic forces are thought to have reduced the possibility of a military conflict, there remains concern about the increasing military buildup of China (China is rapidly increasing its naval capacity), and that any move toward Taiwan independence could potentially spin out of control. Israel is thought to possess somewhere between one hundred and four hundred nuclear warheads. It has been asserted that the Dolphin-class submarines which Israel received from Germany have been adapted to carry Popeye cruise missiles with nuclear warheads, so as to give Israel a second strike capability. Israel has been involved in wars with its neighbors in the Middle East (and with other "non-state actors") on numerous prior occasions, and its small geographic size and population could mean that, in the event of future wars, the Israeli military might have very little time to react to an invasion or other major threat. Such a situation could escalate to nuclear warfare very quickly in some scenarios. On March 7, 2013, North Korea threatened the United States with a pre-emptive nuclear strike. On April 9, North Korea urged foreigners to leave South Korea, stating that both countries were on the verge of nuclear war. On April 12, North Korea stated that a nuclear war was unavoidable. The country declared Japan as its first target. In the year of 2014, when Russian relationships with the USA had become worse, it was stated by the Russian state-owned Russia 1 TV channel that ‘Russia is the only country in the world that is really capable of turning the USA into radioactive ash’. The above examples envisage nuclear warfare at a strategic level, i.e., total war. However, nuclear powers have the ability to undertake more limited engagements. "Sub-strategic use" includes the use of either "low-yield" tactical nuclear weapons, or of variable yield strategic nuclear weapons in a very limited role, as compared to battlefield exchanges of larger-yield strategic nuclear weapons. This was described by the UK Parliamentary Defence Select Committee as "the launch of one or a limited number of missiles against an adversary as a means of conveying a political message, warning or demonstration of resolve". It is believed that all current nuclear weapons states possess tactical nuclear weapons, with the exception of the United Kingdom, which decommissioned its tactical warheads in 1998. However, the UK does possess scalable-yield strategic warheads, and this technology tends to blur the difference between "strategic", "sub-strategic", and "tactical" use or weapons. American, French and British nuclear submarines are believed to carry at least some missiles with dial-a-yield warheads for this purpose, potentially allowing a strike as low as one kiloton (or less) against a single target. Only the People's Republic of China and the Republic of India have declarative, unqualified, unconditional "no first use" nuclear weapons policies. India and Pakistan maintain only a credible minimum deterrence. Commodore Tim Hare, former Director of Nuclear Policy at the British Ministry of Defence, has described "sub-strategic use" as offering the Government "an extra option in the escalatory process before it goes for an all-out strategic strike which would deliver unacceptable damage". However, this sub-strategic capacity has been criticized as potentially increasing the "acceptability" of using nuclear weapons. Combined with the trend in the reduction in the worldwide nuclear arsenal as of 2007 is the warhead miniaturization and modernization of the remaining strategic weapons that is presently occurring in all the declared nuclear weapon states, into more "usable" configurations. The Stockholm International Peace Research Institute suggests that this is creating a culture where use of these weapons is more acceptable and therefore is increasing the risk of war, as these modern weapons do not possess the same psychological deterrent value as the large Cold-War era, multi-megaton warheads. In many ways, this present change in the balance of terror can be seen as the complete embracement of the switch from the 1950s Eisenhower doctrine of "massive retaliation" to one of "flexible response", which has been growing in importance in the US nuclear war fighting plan/SIOP every decade since. For example, the United States adopted a policy in 1996 of allowing the targeting of its nuclear weapons at non-state actors ("terrorists") armed with weapons of mass destruction. Another dimension to the tactical use of nuclear weapons is that of such weapons deployed at sea for use against surface and submarine vessels. Until 1992, vessels of the United States Navy (and their aircraft) deployed various such weapons as bombs, rockets (guided and unguided), torpedoes, and depth charges. Such tactical naval nuclear weapons were considered more acceptable to use early in a conflict because there would be few civilian casualties. It was feared by many planners that such use would probably quickly have escalated into large-scale nuclear war. This situation was particularly exacerbated by the fact that such weapons at sea were not constrained by the safeguards provided by the Permissive Action Link attached to U.S. Air Force and Army nuclear weapons. It is unknown if the navies of the other nuclear powers yet today deploy tactical nuclear weapons at sea. The 2018 US Nuclear Posture Review emphasised the need for the US to have sub-strategic nuclear weapons as additional layers for its nuclear deterrence. Nuclear terrorism by non-state organizations or actors (even individuals) is a largely unknown and understudied factor in nuclear deterrence thinking, as states possessing nuclear weapons are susceptible to retaliation in kind, while sub- or trans-state actors may be less so. The collapse of the Soviet Union has given rise to the possibility that former Soviet nuclear weapons might become available on the black market (so-called 'loose nukes'). A number of other concerns have been expressed about the security of nuclear weapons in newer nuclear powers with relatively less stable governments, such as Pakistan, but in each case, the fears have been addressed to some extent by statements and evidence provided by those nations, as well as cooperative programs between nations. Worry remains, however, in many circles that a relative decrease in security of nuclear weapons has emerged in recent years, and that terrorists or others may attempt to exert control over (or use) nuclear weapons, militarily applicable technology, or nuclear materials and fuel. Another possible nuclear terrorism threat are devices designed to disperse radioactive materials over a large area using conventional explosives, called dirty bombs. The detonation of a "dirty bomb" would not cause a nuclear explosion, nor would it release enough radiation to kill or injure a large number of people. However, it could cause severe disruption and require potentially very costly decontamination procedures and increased spending on security measures. The predictions of the effects of a major countervalue nuclear exchange include millions of city dweller deaths within a short period of time. Some 1980s predictions had gone further and argued that a full-scale nuclear war could eventually bring about the extinction of the human race. Such predictions, sometimes but not always based on total war with nuclear arsenals at Cold War highs, received contemporary criticism. On the other hand, some 1980s governmental predictions, such as FEMA's CRP-2B and NATO's Carte Blanche, have received criticism from groups like the Federation of American Scientists for being overly optimistic. CRP-2B, for instance, infamously predicted that 80% of Americans would survive a nuclear exchange with the Soviet Union, a figure that neglected nuclear war's impacts on healthcare infrastructure, the food supply, and the ecosystem and assumed that all major cities could be successfully evacuated within 3–5 days. A number of Cold War publications advocated preparations that could purportedly enable a large proportion of civilians to survive even a total nuclear war. Among the most famous of these is Nuclear War Survival Skills. To avoid injury and death from a nuclear weapons heat flash and blast effects, the two most far ranging prompt effects of nuclear weapons, schoolchildren were taught to duck and cover by the early Cold War film of the same name. Such advice is once again being given in case of nuclear terrorist attacks. Prussian blue, or "Radiogardase", is stockpiled in the US, along with potassium iodide and DPTA as pharmaceuticals useful in treating internal exposure to harmful radioisotopes in fallout. Publications on adapting to a changing diet and supplying nutritional food sources following a nuclear war, with particular focus on agricultural radioecology, include Nutrition in the postattack environment by the RAND corporation. The British government developed a public alert system for use during nuclear attack with the expectation of a four-minute warning before detonation. The United States expected a warning time of anywhere from half an hour (for land-based missiles) to less than three minutes (for submarine-based weapons). Many countries maintain plans for continuity of government and continuity of operations following a nuclear attack or similar disasters. These range from a designated survivor, intended to ensure survival of some form of government leadership, to the Soviet Dead Hand system, which allows for retaliation even if all Soviet leadership were destroyed. Nuclear submarines are given letters of last resort: orders on what action to take in the event that an enemy nuclear strike has destroyed the government. A number of other countries around the world have taken significant efforts to maximize their survival prospects in the event of large calamities, both natural and manmade. For example, metro stations in Pyongyang, North Korea, were constructed 110 metres (360 ft) below ground, and were designed to serve as nuclear shelters in the event of war, with each station entrance built with thick steel blast doors. An example of privately funded fallout shelters is the Ark Two Shelter in Ontario, Canada, and autonomous shelters have been constructed with an emphasis on post-war networking and reconstruction. In Switzerland, the majority of homes have an underground blast and fallout shelter. The country has an overcapacity of such shelters and can accommodate slightly more than the nation's population size. While the nuclear fallout shelters described above are the ideal long term protection methods against dangerous radiation exposure in the event of a nuclear catastrophe, it is also necessary to have mobile protection equipment for medical and security personnel to safely assist in containment, evacuation, and many other necessary public safety objectives which ensue as a result of nuclear detonation. There are many basic shielding strategies used to protect against the deposition of radio active material from external radiation environments. Respirators which protect against internal deposition are used to prevent the inhalation and ingestion of radioactive material and dermal protective equipment which is used to protect against the deposition of material on external structures like skin, hair, and clothing. While these protection strategies do slightly reduce the exposure, they provide almost no protection from externally penetrating gamma radiation, which is the cause of Acute Radiation Syndrome and can be extremely lethal in high dosages. Naturally, shielding the entire body from high energy gamma radiation is optimal, but the required mass to provide adequate attenuation makes functional movement nearly impossible. Recent scientific studies have shown the feasibility of partial body shielding as a viable protection strategy against externally penetrating gamma radiation. The concept is based in providing sufficient attenuation to only the most radio-sensitive organs and tissues in efforts to defer the onset of Acute Radiation Syndrome, the most immediate threat to humans from high doses of gamma radiation. Acute Radiation Syndrome is a result of irreversible bone marrow damage from high energy radiation exposure. Due to the regenerative property of hematopoietic stem cells found in bone marrow, it is only necessary to protect enough bone marrow to repopulate the exposed areas of the body with the shielded supply. Because 50% of the body's supply of bone marrow is stored in the pelvic region which is also in close proximity to other radio-sensitive organs in the abdomen, the lower torso is a logical choice as the primary target for protection. This research allows for the development of relatively lightweight mobile radiation protection equipment which can provide life saving protection from intense radioactive environments without hindering functional mobility. This technology has wide-ranging military, emergency personnel, private sector, and civilian application as the radiation risks of nuclear energy, warfare, and terrorism around the world continue to grow. One example of such technology is the 360 Gamma, a radiation protection belt designed on the principles of bone marrow shielding. More information on bone marrow shielding can be found in the Health Physics Radiation Safety Journal article Selective Shielding of Bone Marrow: An Approach to Protecting Humans from External Gamma Radiation, or in the Organisation for Economic Co-operation and Development (OECD) and the Nuclear Energy Agency (NEA)'s 2015 report: Occupational Radiation Protection in Severe Accident Management. Nuclear warfare and weapons are staple elements of speculative fiction. Wikimedia Commons has media related to Nuclear warfare. ^ "7 Possible Toxic Environments Following a Nuclear War – The Medical Implications of Nuclear War 1985 – The National Academies Press". ^ "nuclear winter". Encyclopædia Britannica. ^ a b Martin, Brian (December 1982). "The global health effects of nuclear war". Current Affairs Bulletin. 59 (7). ^ a b "The Effects of a Global Thermonuclear War". ^ Long-term worldwide effects of multiple nuclear-weapons detonations. Assembly of Mathematical and Physical Sciences, National Research Council,1975. ^ "Overview of the Doomsday Clock". Bulletin of the Atomic Scientists. ^ Hersh, Seymour (1991). The Samson Option. Random House. p. 130. ISBN 0-394-57006-5. ^ John Pike. "Nuclear Weapons Program". ^ ""1945–1998" by Isao Hashimoto". ^ "The Nuclear Testing Tally – Arms Control Association". ^ N.N. Sokov (2015). Why Russia calls a limited nuclear strike "de-escalation". Bulletin of the Atomic Scientists. Retrieved 2015-12-28. ^ Grover, Herbert D.; Harwell, Mark A. (1985-10-01). "Biological Effects of Nuclear War II: Impact on the Biosphere". BioScience. 35 (9): 576–583. doi:10.2307/1309966. ISSN 0006-3568. ^ "Henry Kissinger: The Mike Wallace Interview". ^ Alan F. Philips, 20 Mishaps That Might Have Started Accidental Nuclear War. ^ "1945 Tokyo Firebombing Left Legacy of Terror, Pain". Common Dreams. ^ "March 9, 1945: Burning the Heart Out of the Enemy". Wired. Condé Nast Digital. 9 March 2011. Retrieved June 8, 2014. ^ "Firebombing of Tokyo". HISTORY.com. ^ "Japan's Battle of Okinawa, March–June 1945". Command and General Staff College. Archived from the original on February 14, 2009. Retrieved 2016-12-13. ^ Ways of Forgetting, Ways of Remembering: Japan in the Modern World. New Press. February 4, 2014. p. 273. ^ "United States Dept. of the Army, Army Battle Casualties and Non Battle Deaths in World War II". Cgsc.cdmhost.com. Retrieved 2011-06-15. ^ "Milestones: 1937–1945 / The Potsdam Conference, 1945". United States Department of State, Office of the Historian. Archived from the original on 2013-10-29. ^ Newman, Robert P. (1995). Truman and the Hiroshima Cult. MSU Press. p. 86. ISBN 978-0-87013-940-6. ^ "The Atomic Bomb and the End of World War II, A Collection of Primary Sources" (PDF). National Security Archive Electronic Briefing Book No. 162. George Washington University. August 13, 1945. ^ Alan Axelrod (May 6, 2008). The Real History of World War II: A New Look at the Past. Sterling. p. 350. ^ Nuke-Rebuke: Writers & Artists Against Nuclear Energy & Weapons (The Contemporary anthology series). The Spirit That Moves Us Press. May 1, 1984. pp. 22–29. ^ Robert Hull (October 11, 2011). Welcome To Planet Earth – 2050 – Population Zero. AuthorHouse. p. 215. ISBN 1-4634-2604-6. ^ Koizumi, Junichiro (August 6, 2005). "Address by Prime Minister Junichiro Koizumi at the Hiroshima Memorial Service for the Hiroshima Peace Memorial Ceremony". Prime Minister of Japan and His Cabinet. Retrieved Nov 28, 2007. ^ Pontin, Jason (November–December 2007). "Oppenheimer's Ghost". Technology Review. ^ "Instant Wisdom: Beyond the Little Red Book". TIME. September 20, 1976. ^ "Nuclear Strategy differences in Soviet and American thinking". ^ "Candid Interviews with Former Soviet Officials Reveal U.S. Strategic Intelligence Failure Over Decades". ^ Viktor Suvorov, Shadow of Victory (Тень победы), Donetsk, 2003, ISBN 966-696-022-2, pages 353–375. ^ "The Cost of Submarines". Fast Attacks and Boomers. Retrieved 2008-07-13. ^ Stothers, Richard B. (1984). "The Great Tambora Eruption in 1815 and Its Aftermath". Science. 224 (4654): 1191–1198. Bibcode:1984Sci...224.1191S. doi:10.1126/science.224.4654.1191. PMID 17819476. ^ "Supersized eruptions are all the rage!". USGS. April 28, 2005. ^ Robock, A.; C.M. Ammann; L. Oman; D. Shindell; S. Levis; G. Stenchikov (2009). "Did the Toba volcanic eruption of ~74k BP produce widespread glaciation?". Journal of Geophysical Research. 114: D10107. Bibcode:2009JGRD..11410107R. doi:10.1029/2008JD011652. ^ Huang, C.Y. ; Zhao, M.X. ; Wang, C.C. ; Wei, G.J. (2001). "Cooling of the South China Sea by the Toba Eruption and correlation with other climate proxies ∼71,000 years ago". Geophysical Research Letters. 28 (20): 3915–3918. Bibcode:2001GeoRL..28.3915H. doi:10.1029/2000GL006113. ^ a b "WINDOW ON HEARTLAND Geopolitical notes on Eastern Europe, the Caucasus and Central Asia". Archived from the original on April 24, 2013. ^ a b "Global Security.org Kosvinsky Mountain, Kos'vinskiy Kamen', Gora, MT 59°31'00"N 59°04'00"E". ^ "Context of '(After 11:15 a.m.) September 11, 2001: Russian President Putin Speaks with President Bush'". ^ Bhumitra Chakma (2004). Strategic Dynamics and Nuclear Weapons Proliferation in South Asia: A Historical Analysis. Peter Lang. p. 133. ISBN 978-3-03910-382-9. ^ Zafar Khan (17 July 2014). Pakistan's Nuclear Policy: A Minimum Credible Deterrence. Routledge. p. 23. ISBN 978-1-317-67601-0. ^ Jacques E. C. Hymans (16 February 2012). Achieving Nuclear Ambitions: Scientists, Politicians, and Proliferation. Cambridge University Press. p. 244. ISBN 978-0-521-76700-2. ^ Shaun Gregory (23 October 2015). Democratic Transition and Security in Pakistan. Routledge. p. 250. ISBN 978-1-317-55011-2. ^ "BBC NEWS – Asia-Pacific – N Korea faces new UN resolution". ^ "Pakistan 'prepared nuclear strike'". BBC News. ^ "Israel buys 2 nuclear-capable submarines from Germany". ^ "North Korea threatens nuclear strike, U.N. expands sanctions". Reuters. 2013-03-07. Retrieved 2013-05-07. ^ "North Korea urges foreigners to leave South Korea". CBC. 2013-04-09. Retrieved 2013-05-07. ^ Meredith, Charlotte (2013-04-12). "North Korea states 'nuclear war is unavoidable' as it declares first target will be Japan". Express. Retrieved 2013-05-07. ^ UK Parliament, House of Commons, "Select Committee on Defence, Eighth Report", , 20 June 2006. Fetched from URL on 23 December 2012. ^ "House of Commons – Defence – Eighth Report – THE 1998 STRATEGIC DEFENCE REVIEW". ^ Jones, Matthew (2008). "Targeting China: U.S. Nuclear Planning and 'Massive Retaliation' in East Asia, 1953–1955". Journal of Cold War Studies. 10 (4): 37–65. doi:10.1162/jcws.2008.10.4.37. ^ "Declassified: Nuclear Weapons at Sea, Conclusions and Recommendations". Federation of American Scientists. Retrieved 2016-04-19. ^ "2018 Nuclear Posture Review". US Defense Department. Retrieved 2018-06-26. ^ US Nuclear Regulatory Commission (May 2007). "Backgrounder on Dirty Bombs". Retrieved 2010-04-26. ^ Bumstead, Pamela (December 6, 1985). NUCLEAR WINTER: THE ANTHROPOLOGY OF HUMAN SURVIVAL (PDF). 84th Annual Meeting of the American Anthropological Association. Washington, DC: American Anthropological Association. ^ Kearny, Cresson H (1986). Nuclear War Survival Skills. Oak Ridge, TN: Oak Ridge National Laboratory. pp. 6–11. ISBN 0-942487-01-X. ^ Glenn Harlan Reynolds. "The Unexpected Return of 'Duck and Cover'". The Atlantic. ^ "Strategic National Stockpile (SNS)". ^ "Nutrition in the postattack environment". ^ "Doomsday Preppers: It's Gonna Get Worse Tonight at 9P et/pt". Nat Geo TV Blogs. ^ Ball, Deborah (2011-06-25). "Swiss Renew Push for Bomb Shelters". The Wall Street Journal. ^ Foulkes, Imogen (2007-02-10). "Swiss still braced for nuclear war". BBC News. ^ Waterman, Gideon; Kase, Kenneth; Orion, Itzhak; Broisman, Andrey; Milstein, Oren (2017-09). "Selective Shielding of Bone Marrow". Health Physics. 113 (3): 195–208. doi:10.1097/hp.0000000000000688. ISSN 0017-9078. "Possibility of Nuclear War in Asia: An Indian Perspective", a project of United Service Institution of India, USI, Discusses the possibility of a nuclear war in Asia from the Indian point of view. Thomas Powers, "The Nuclear Worrier" (review of Daniel Ellsberg, The Doomsday Machine: Confessions of a Nuclear War Planner, New York, Bloomsbury, 2017, ISBN 9781608196708, 420 pp. ), The New York Review of Books, vol. LXV, no. 1 (18 January 2018), pp. 13–15. "Presidency in the Nuclear Age", conference and forum at the JFK Library, Boston, October 12, 2009. Four panels: "The Race to Build the Bomb and the Decision to Use It", "Cuban Missile Crisis and the First Nuclear Test Ban Treaty", "The Cold War and the Nuclear Arms Race", and "Nuclear Weapons, Terrorism, and the Presidency". 20 Mishaps That Might Have Started Accidental Nuclear War by Alan F. Philips, M.D. DeVolpi, Alexander, Vladimir E. Minkov, Vadim A. Simonenko, and George S. Stanford. 2004. Nuclear Shadowboxing: Contemporary Threats from Cold War Weaponry, Vols. 1 and 2. Fidlar Doubleday. NUKEMAP3D – a 3D nuclear weapons effects simulator powered by Google Maps. This page was last edited on 13 April 2019, at 23:23 (UTC).